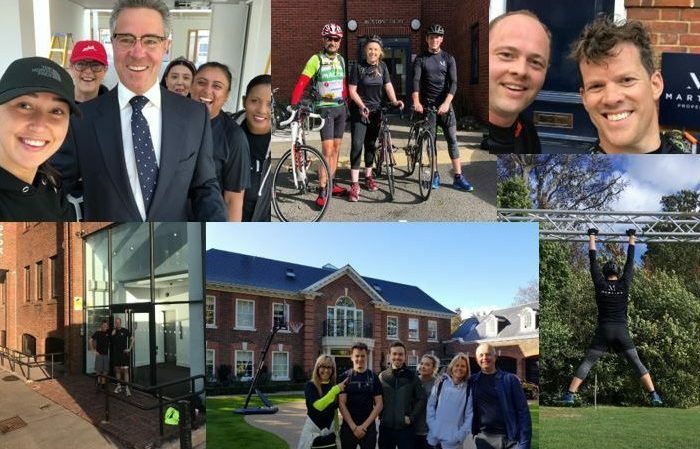 Last Friday the Martin’s Properties team walked, jogged, ran and cycled a total of 450 miles across their entire property portfolio raising over £4,500 for Great Ormond Street Children’s Hospital and Rethink Mental Illness. The Sevenoaks duo, were the first to set off on their gruelling 38 mile hoof from the South Park Offices in Sevenoaks. Starting at 7.30am with a brisk walk, MD Richard Bourne soon had Brook Stotesbury running through the Kent countryside arriving at the head office in Walpole Street, London at 5.30pm. Team Oxford were not perturbed by train delays and were mounted and ready to cycle 72 miles in 7.5 hours from Buxton Court to HQ, covering Wedgwood Villas in Chiswick And the Cineworld Fulham Cinema on their return to London. Team Islington started bright and early from the newly completed Old Sorting House offices, starting with a quick photoshoot. The team visited the majority of the portfolio across Central London finishing with our King’s Road properties and enjoying a well-earned drink at The Ivy Chelsea Garden. Team Oxshott had one of the most scenic strolls from Oxshott Rise through Richmond Park finishing the 22 mile walk in good time to tick off Alexandra House in Parsons Green, Cheyne Walk, Munro Terrace and Markham Square before checking on construction activity in Old Church Street and Radnor Walk. With energy still to burn MD Richard Bourne arrived at the office beaming and full of praise for the team.